Since the late 1980s I've been a huge fan of the Coca-Cola Summer Film Festival at the Fox Theatre. And this year's lineup is filled with summer blockbusters and fun classics...there's something for everyone! My initiation was a 50th anniversary showing in 1989 of the Oscar-winning Gone With the Wind, which was the first time I'd ever seen that film. Movies, no matter the film, are a special experience at The Fox. The movies are peppered throughout the summer, various days of the weeks and programming for kids is usually earlier in the day. And if you get there early enough, you get to experience an incredibly unique pre-show of a sing-a-long, to the Fox's "Mighty Mo" organ, and a vintage cartoon! Friday, June 14 - 7:30 p.m.
Saturday Morning Cartoons Saturday, June 15 - 10:00 a.m.
Saturday, June 15 - 7:30 p.m.
Friday, June 21 - 7:30 p.m.
Saturday, June 22 - 2:00 p.m.
Saturday, July 27 - 2:00 p.m.
Saturday, August 17 - 10:00 a.m.
Sunday, August 18 - 4:00 p.m. There will be even more films announced, so keep an eye on the Fox Theatre's website. One of the remarkable things about films at The Fox is that in such a gorgeous, renowned historical theatre, movies cost even less than they do in mainstream movie houses. 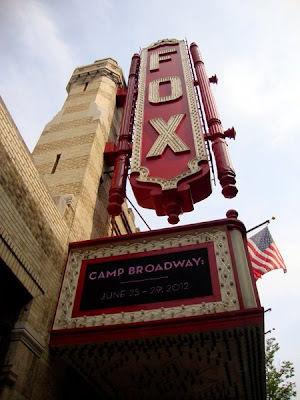 Go see a movie at the Fox!